The etiopathogenesis of Behçet’s Disease is not clearly understood. Recurrent aphthous stomatitis is seen in Behçet’s Disease. Mucous membranes are protected by general host defenses, a specific immune response to damage caused by free radicals under normal conditions. Nitric oxide is a free radical that plays a role in chronic and acute inflammation and systemic inflammatory response. Our purpose was to investigate the levels of nitric oxide in serum and saliva samples from patients with Behçet’s Disease and recurrent aphthous stomatitis and from a control group. In the clinical study, 22 patients with Behçet’s Disease, 24 patients with recurrent aphthous stomatitis, and 27 healthy individuals were included. Serum and saliva samples were taken from each group to examine nitric oxide levels. When the nitric oxide levels of serum and saliva were evaluated, the only statistically significant finding was that nitrate and nitrite levels were lower in the control group than in patients with Behçet’s Disease and recurrent aphthous stomatitis. There was no difference between patients with Behçet’s Disease and patients with recurrent aphthous stomatitis. We conclude that nitric oxide levels increase in patients with Behçet’s Disease and recurrent aphthous stomatitis, both in serum and saliva. The results of nitric oxide in saliva and serum were found to be compatible. Saliva can be used to evaluate nitric oxide in Behçet’s Disease and recurrent aphthous stomatitis. Salivary nitric oxide levels may be an important marker for estimating the severity of Behçet’s Disease for clinicians. Behçet’s disease (BD) was first identified in 1937 by Professor Dr. Hulusi Behçet. Uveitis and oral and genital ulcers are the classic triple symptoms of BD. In addition, the involvement of the joints and the cardiovascular, gastrointestinal, respiratory, and central nervous systems is found in BD. The etiopathogenesis of BD is not clearly understood, although it appears to be caused by intensive inflammatory response triggered by an infectious agent in genetically predisposed individuals . Recurrent aphthous stomatitis (RAS) is an oral mucosa disease. RAS is painful, chronic, and idiopathic. Viral or bacterial infections, malnutrition, trauma, stress, systemic diseases, the immune system, and/or genetic factors are thought to be effective in the etiology of RAS . However, the etiology of RAS has still not been explained in detail . The oral lesions seen in BD and RAS are the same . Mucous membranes are protected by general host defenses, a protective surface phenomenon and specific immune response to damage caused by free radicals under normal conditions . Free radicals affect all important compounds of cells, such as lipids, proteins, DNA, and carbohydrates, causing their structure to deteriorate . Nitric oxide (NO) is a free radical that plays a role in chronic and acute inflammation, systemic inflammatory response, and sepsis. It is known that BD is an inflammatory disease, and increased NO production has been reported in the serum of patients with BD . However, to our knowledge, no study has yet examined NO levels in the saliva of patients with BD. Our purpose was to investigate the levels of NO in serum and saliva samples from patients with BD and RAS. This study was carried out with the Faculty of Dentistry of Selcuk University and the Department of Oral and Maxillofacial Surgery and Dermatology Clinic of Konya Baskent Research Hospital. All patients were informed about the study, and their written consent was obtained. Seventy-three patients (37 male, 36 female) were included in the study. The mean age of the patients was 34.5 ± 8.4 years. History of smoking habits, alcohol consumption, periodontal problem, and any systemic disease were among the exclusion criteria. Three groups were planned in the study. Patients who had oral aphthous stomatitis at least 4–5 times a year but who were without systemic diseases or nutritional deficiency formed the RAS group. All patients with RAS were in the ulcerative stage. Four patients had major aphthous stomatitis, 2 patients had herpetiform aphthous stomatitis, and 18 patients had minor aphthous stomatitis. All BD patients fulfilled the criteria of the International Study Group for BD . All patients had an oral aphthous stomatitis, genital ulcers in 16 patients, ocular lesions in 5 patients; cutaneous lesions (including papulopustular lesions and/or acneiform nodules and/or erythema nodosum) in 13 patients and arthralgia in 13 patients were found. The patients who had at least two of the diagnostic criteria were assumed to be in the active stage . Fourteen patients with BD were in the active phase and 8 patients with BD were in the passive phase. Healthy individuals with no systemic problems formed the control group. They did not have any history of RAS or BD. Venous blood samples of 5 ml were taken between 9.00 and 10.00 a.m. from each participant. The blood samples were placed in tubes containing 1 ml ethylendiamine tetrasetic acid (EDTA) and centrifuged at 500×g for 15 min. The tubes were stored at − 80 °C. Before the saliva samples were taken, the patient’s mouths were rinsed with 10% povidone iodine to reduce bacterial contamination. The serum and saliva samples were taken in the same session. A 2 ml sample of saliva was collected in a sterile container. The samples were then centrifuged for 10 min at 4000×g and stored at − 40 °C. Both the saliva and the blood samples were taken at the same time. Biochemical analyses were carried out at the Research Laboratory of the Selcuk University Faculty of Dentistry. Biochemical solvents (chloroform and methanol) were used for analysis of biochemical parameters, and chromatographic purity was ensured using a degasser process. Preparation and dilution of solutions was carried out using ultra-pure water. For spectrophotometric analysis, the μQuant device (Bio-Tek Instruments, Inc.) was used at the Research Laboratory of the Faculty of Dentistry at Selcuk University. Nitric oxide, a free radical, is not stable in an oxygenated environment. It spontaneously reacts with molecular oxygen and transforms into various nitrogen products . The most stable of these products are NO3− (nitrate) and NO2− (nitrite). Nitrate and nitrite combined gives NO. The Griess method was used to determine nitrate and nitrite concentrations in the saliva and serum samples (Cayman Chemical Nitrate/Nitrite Assay Kit, 780001). Distribution data was tested with Shapiro-Wilk. The nitrate and nitrite distribution differences in the serum and saliva samples from each group were evaluated using one-way analysis of variance (ANOVA). The differences between the groups were compared using Tukey’s test. Results were given as the mean ± SD. The significance limit was accepted as 0.05 (p < 0.05). Twenty-two patients with BD (11 male, 11 female), 24 patients with RAS (9 male, 15 female), and 27 healthy individuals (17 male, 10 female) were included in the study. The mean age of the patients with BD was 38.54 ± 6.62 years, the mean age of the patients with RAS was 30.2 ± 8.71 years, and the mean age of the control group was 33.4 ± 10.06 years. The patient groups and the control group showed a similar distribution in terms of gender and age (p > 0.05) (Table 1). When levels of nitrate and nitrite were evaluated in the BD group, the RAS group, and the control group, the only statistically significant finding was that nitrate and nitrite levels were lower in the control group than in the BD and RAS groups (p = 0.01). Levels of nitrate and nitrite were found in patients with active BD in comparison with patients with inactive BD (p = 0.045). The serum mean nitrate levels in patients with BD, RAS, and control group were found to be 1.631 ± 0.28, 1.777 ± 0.32, and 1.237 ± 0.18 μmolar respectively. The saliva mean nitrate levels in patients with BD, RAS, and control group were found to be 9.168 ± 1.30, 8.532 ± 0.77, and 7.343 ± 0.57 μmolar respectively. The serum mean nitrite levels in patients with BD and RA, and the control group were found to be 0.180 ± 0.037, 0.161 ± 0.02, and 0.079 ± 0.023 μmolar respectively. The saliva mean nitrite levels in patients with BD and RAS and the control groups were found to be 3.326 ± 0.424, 3.098 ± 1.152, and 1.326 ± 0.574 μmolar respectively. 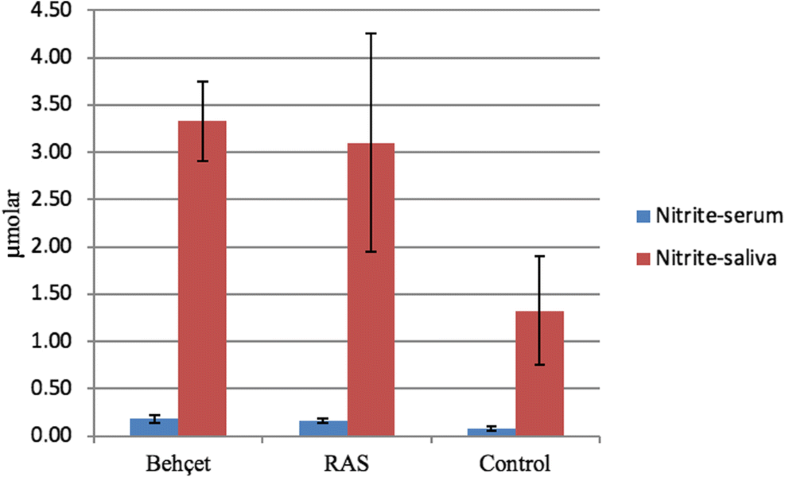 There was no difference between the patients with BD and the patients with RAS (p = 0.42) (Figs. 1 and 2). In many pathophysiological conditions and normal physiological conditions, NO is an important product for maintaining homeostasis. NO causes no damage to tissues under normal physiological conditions, because it is quickly removed from the blood by the reaction of oxyhemoglobin. However, the presence of inducible nitric oxide synthase (iNOS) enzyme leads to increased production of NO in pathological conditions such as diseases of the cardiovascular and nervous systems, immunological diseases, and cancer. Certain proinflammatory cytokines, particularly in inflammatory reactions, cause an increase in iNOS enzyme in monocytes, macrophages, neutrophils, and some other cells . NO is a colorless radical that can be dissolved in water and oil. The half-life of NO is 30 s. It can be oxidized to nitrate (NO3−) and nitrite (NO2−), and it may lead to endothelial damage. The radical structure and very short life of NO makes it difficult to examine. Because of this, in the present study, the final products of NO (nitrate and nitrite) were examined in serum and plasma . For the examination of levels of nitrate and nitrite, the patients were told not to eat or drink for at least 8 h before the blood samples were taken; this is because nitrate and nitrite enter the body through food, and digestion begins in the mouth. Samples were collected from the patients between 9.00 and 10.00 a.m. in order not to affect the NO values in the serum and saliva. Saliva has been used very frequently in the diagnosis, imaging, and prognosis of systemic diseases, and in monitoring the progression of such diseases. Saliva is helpful in the examination of biomarkers in fields such as clinical pathology, forensic medicine, immunology, and sports medicine . However, the use of saliva is not common in the examination of possible indicators of BD or RAS . Studies examining changes in NO metabolism in BD have so far been limited to examinations of tears and serum . 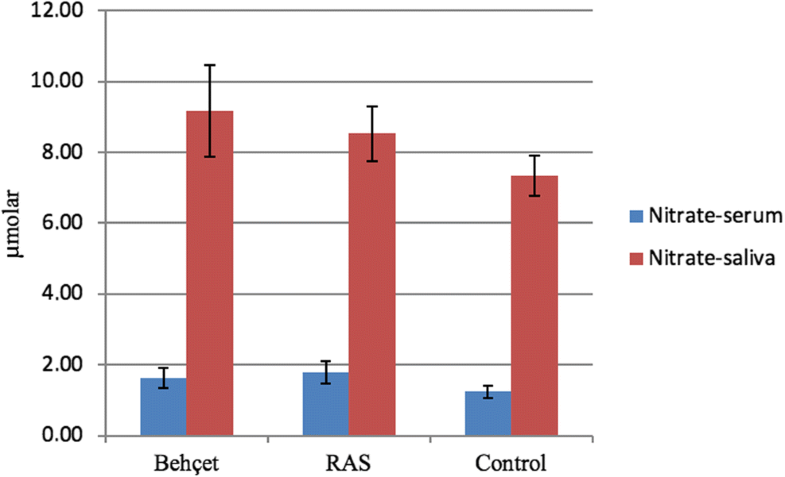 A few studies have investigated NO levels in the saliva of patients with RAS, but the present study is the first to examine the saliva of patients with BD; NO levels in serum and saliva were measured in both BD and RAS patients. We believe that saliva, like serum or plasma, should be examined routinely. The number of studies conducted using saliva should be increased so that a useful literature can be built up. The role of NO in saliva has not been fully explained . However, Moncada et al. and Stuehr et al. reported that NO production in the salivary glands is regulated by the central and peripheral nervous system with a neural mechanism [15, 16]. As a result of the placement of the neural nitric oxide synthase (nNOS) enzyme in the salivary gland, it is clear that NO plays a role in the regulation of blood flow and secretion of the salivary gland and is effective in the etiology of RAS . Emotional stress causes the neuroendocrine level of the saliva to increase , and as a result, an increase in nNOS activity causes NO to be released . In our study, both patients with BD and patients with RAS were generally from lower socioeconomic classes, and the patients reported that their lives were stressful. Therefore, increased activity of nNOS due to stress in patients with BD and RAS may explain the production of NO. NO is a key mediator that can cause tissue injury and cell damage when excessive quantities are produced . Researchers believe that ulceration occurs as a result of increased presence of free radicals such as NO . For these reasons, it has been claimed that free radicals, including NO, play a role in the pathogenesis of RAS . In our study, NO levels were found to be increased in both BD and RAS patients, and we therefore believe that increased levels of NO may be a cause of ulceration in the oral mucosa. Many articles have examined levels of NO in the serum and plasma of patients with BD. Djerabaa et al. , and Sancak et al. found increased NO levels in BD. Evereklioğlu et al. reported increased NO levels in 42 patients with BD. Yıldırım et al. found that NO levels in serum were higher in patients with BD than in patients with RAS and in healthy subjects. Gündüz et al. examined NO levels in plasma and found no significant differences among patients with BD, patients with RAS, and the control group. As a result, they concluded that NO did not play a primary role in inflammation reactions in BD or RAS. Ohashi et al. measured NO levels in the saliva of 39 patients with oral mucosal disease (RAS and oral lichen planus). They detected significantly increased levels of NO compared to healthy individuals and attributed this to cell damage. Sunitha et al. and Jagtap et al. examined levels of NO in the saliva of patients with oral lichen planus and RAS. They concluded that increased NO levels were effective in the pathophysiology of these diseases. Some studies have shown that NO levels in blood are especially increased in inflammatory reactions, owing to increased levels of iNOS . In our study, NO levels were examined in both serum and saliva. 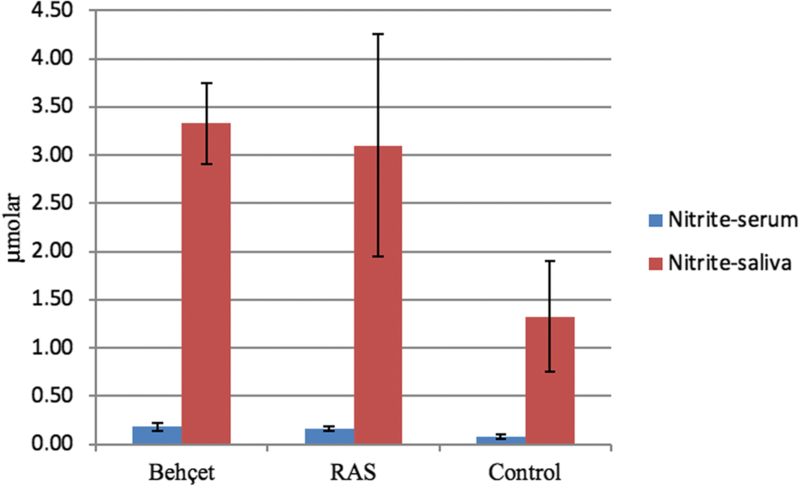 There was no significant difference between patients with BD and patients with RAS. However, NO levels were found to be lower in the control group. The number of patients should be increased and a multicenter study can be planned. These are limitations to our study. In order to confirm the results, further studies should be done to evaluate the levels of nitric oxide in saliva of patients with BD and RAS. 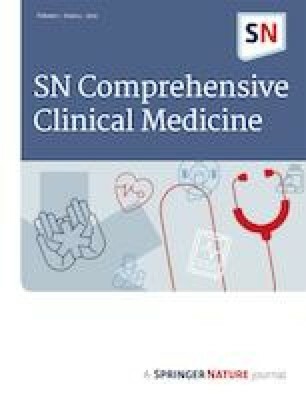 To the best of our knowledge, this article is the first study to examine the role of NO in saliva in patients with BD and RAS. We found increased levels of NO in the saliva of patients with BD and RAS. Saliva can also be used to evaluate levels of NO in BD and RAS. We conclude that salivary NO levels may be an important marker for estimating the severity of BD. The clinicians may use this for prognostic implication.